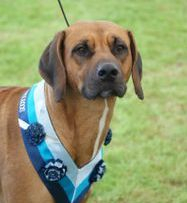 Teddy to date has won a total of 8 Challenge Certificates 4 with Best of Breed, and a further 6 Reserve Challenge Certificates. 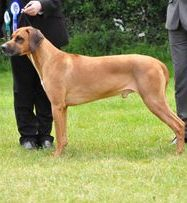 He also has a Hound Group 2 placing to add to his credit from Paignton Championship Show and a Group 3 from Three Counties. He is a Junior Warrant and Show Certificate of Merit winner. Teddy is owned in Partnership Sonstraal with Nicholas Boyd (Sescheke kennel), and resides in Edinburgh with Nicholas and his mother Linda. 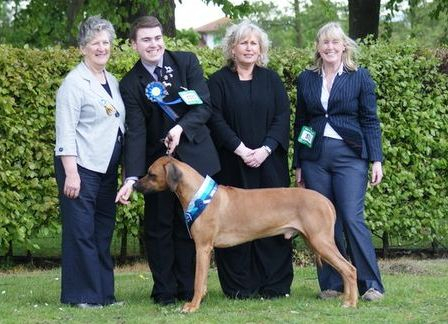 Teddy pictured below winning his 3rd CC with Best of Breed making him a UK Champion. Thanks to Breed Specialist Mrs Pat Thorne. Left to right - Mrs Thorne, Nicholas Boyd, Anthea Fox and Sharon Rossiter. 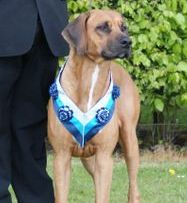 Teddy has had 2 litters, producing a UK Champion and RCC winner.